If you’ve heard the expression ‘the cobbler has no shoes’ then you can imagine the state of the house I bought 11 months ago. You know those real estate listings, “For the handy man”? Yup, that’s the one. In original condition, right down to the turquoise kitchen tiles, this is the perfect house for a renovator. New roof on. 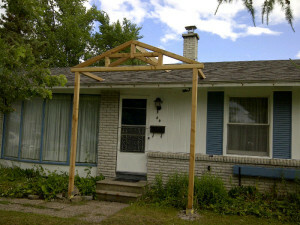 Porch day 1. My house inspection (yes, renovators hire inspectors too) was during one of those torrential downpours in fall 2010. We actually watched rain come in through the ceiling. So, I took some time off. Murphy’s Law, we had a heat wave that first week. Temperatures climbed to 30C and above. 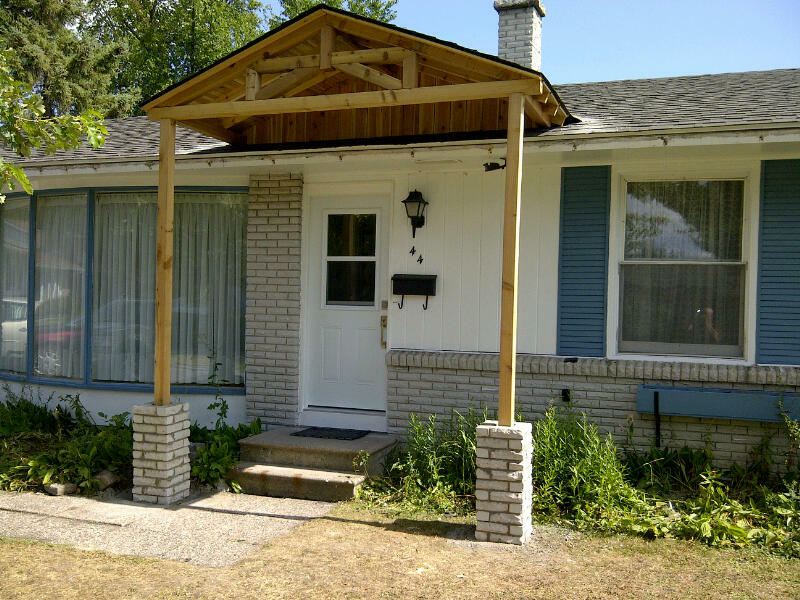 Compled porch. New front door. Now to deal with the blue shutters, trim and planter box. To say we like going to work is an understatement. I was working on everyone else’s homes while neglecting my own. After nearly a year owning this place, the roof had to get fixed. 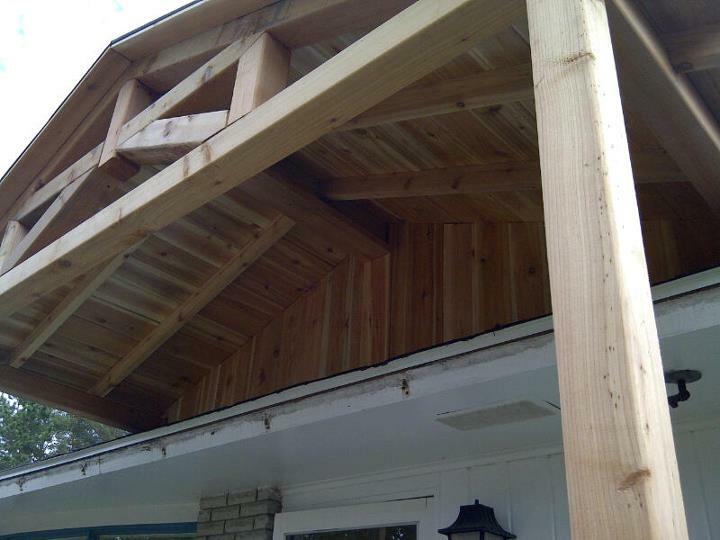 Cedar-lined porch. Am going to install small exterior lights to highlight the detail at night. An awesome neighbour generously shares access to their pool. Their kindness was even more appreciated that week! As luck would have it, the home builder left a stack of the original bricks in the basement. Never throw such a thing away. 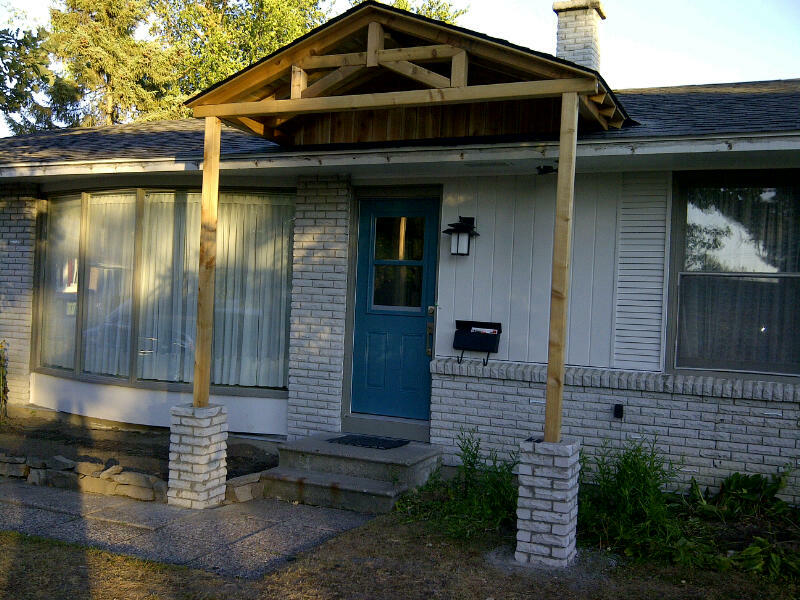 60 years after the house was built, those extra bricks came in handy to put around the base of the pillars. As these projects go, and as clients experience themselves, one thing led to another… a new roof led to a porch, to a front door, to painting the exterior. All with Don and John pitching in (thanks guys!!). Paint colours are: CIL Designer Grey (siding), CIL Mountain Grey (trim) and CIL Berkley Blue (door). Porch light is by Gen-lite from Rona. Door is from Home Depot. House numbers will be Atlas Homewares RCN Mission House Home Address Number. Mailbox will be custom airbrushed by Sergio Alvarez of LNS Airbrush Designs (613-851-9797).